Meissen Porcelain History-The Meissen Porcelain history is very interesting. Meissen porcelain was the first European porcelain ever to be made in 1710 For years, alchemists tried to discover the formula for porcelain. Bottger, an alchemist , discovered the first European porcelain.. In 1710, after kaolin was discovered, the Meissen porcelain company was started under August the Strong. All the royal families in Europe desired vessels made out of this porcelain. They used their best sculpturers and painters to model figures and paint the porcelain. They had a special painting school called The Meissen Drawing School to train modelers and painters as early as 1764. The training took three years before artists mastered the skills to paint on Meissen porcelain. Meissen porcelain patterns have been copied by many other china makers all over the world like Royal Copenhagen, Dresden, Herend, and many other makers. The glaze on Meissen porcelain maintains its quality over time. This is why old Meissen looks so new and keeps its good condition. Other porcelains graze and have many more problems staying in good condition. 1) rare Chinese butterfly- I have never seen another set of this in 22 years. It is beautiful with its relief work and Chinese butterflies. This set is 1953-1957. 2) Large flower and bugs; these are amazing works of art, as each piece is painted with a different bouquet. It would take many artists many months to paint a set like this. You could not pay someone enough many to paint these now a days. This set is 1880s-1890s. 3) The streublumen set is special. Streublumen means thrown flowers. In Germany , it used to be a tradition to throw flowers at weddings. Thus, the streublumen dinner set was made. Every piece is painted with different small flowers. 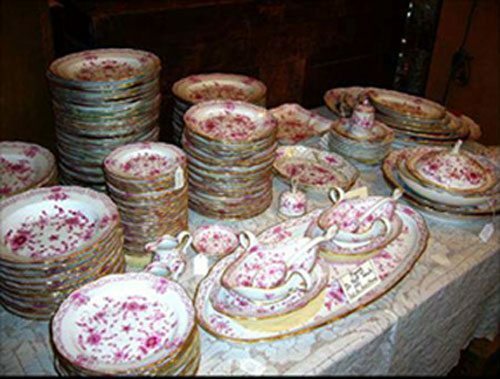 If you go to Newport, Rhode Island and look in the pantry of the Vanderbilt’s “summer cottages”, mansions, you will find that they used streublumen china. Most of this extensive set is late 19th century. 4} The purple Indian set is breathtaking. People all stop to say what an incredible set. It is all from the 1880s-1890s. It is very rare to find such a large set that is so old in such perfect condition. During World War Two, much of the Meissen porcelain was either damaged or destroyed. People hid their treasures like Meissen porcelain and paintings like Renoir's away, so the soldiers and officers would not find them. 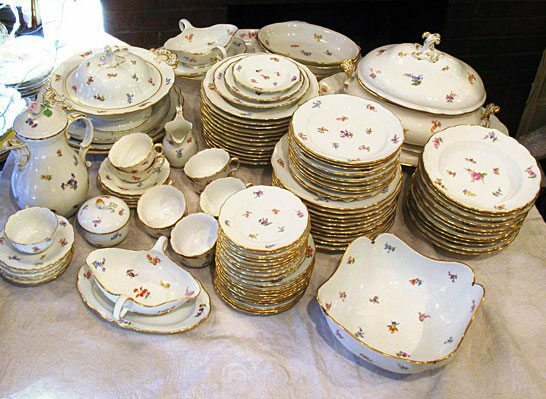 This is why it is so difficult to find extensive dinner services of antique Meissen porcelain in great condition. 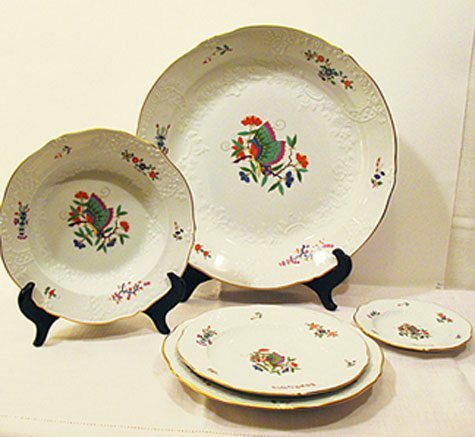 We are proud to offer these four rare Meissen dinner services to you. 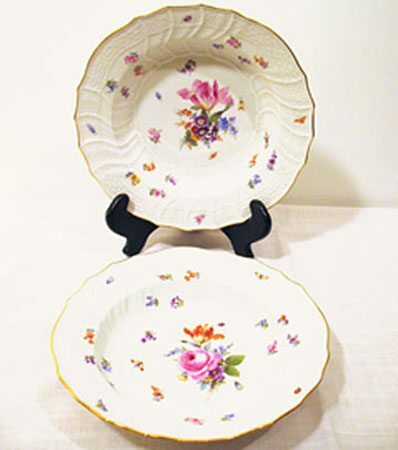 We have a service for twelve of this rare Meissen Chinese butterfly set including dinners, lunches or desserts and breads. We also have a tureen. Prices on Request.